Israeli Prime Minister Benjamin Netanyahu with U.S. special envoy Jason Greenblatt at the Prime Minister's Office in Jerusalem, on July 12, 2017. Photo by Matty Stern/U.S. Embassy Tel Aviv. “One thing that is not acceptable to the Trump administration is to compromise Israel's security in any manner whatsoever,” said U.S. special envoy to the Middle East Jason Greenblatt. (March 31, 2019 / JNS) Following a continued rocket barrage from Gaza into Israeli population centers and “Land Day” protests along the Gaza border that resulted in the deaths of four Palestinians, U.S. President Donald Trump’s special envoy to the Middle East, Jason Greenblatt, said that the United States “will not waver from support of Israel defending itself. 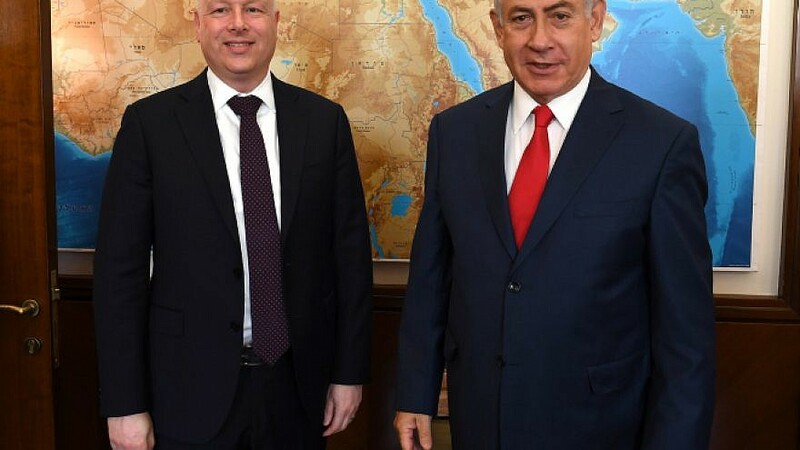 Greenblatt’s remarks came less than a week after Trump signed an executive order officially recognizing Israeli sovereignty over the Golan Heights. Both Gaza and the Golan were captured by Israel during the 1967 Six-Day War in which Egypt, Syria, Jordan and Iraq all attacked Israel. Israel applied full Israeli law over the Golan Heights in 1981 and withdrew from the Gaza Strip in 2005. While the Golan has turned into a strategic security asset for Israel, Gaza has turned into a constant security hazard. “When the president announced the Golan recognition, he was very clear in his remarks that we absolutely support the right of Israel to defend itself,” said Greenblatt. Greenblatt suggested that making announcements that put the security of Israel ahead of other considerations improves the chances that Israel can reach a comprehensive peace deal with Palestinians. The chief negotiator said that the administration is “clear-eyed about the challenges” of reaching a comprehensive agreement in one of the world’s most high-profile conflicts, and suggested that the administration had learned from past attempts by previous administrations to reach a final-status arrangement. Greenblatt acknowledged the possibility that a plan could in fact create more instability if interested parties seek to sabotage the plan’s objectives. Greenblatt suggested that taking a new approach over past administrations will give the current peace plan a greater chance for success. “We don’t believe that solving this conflict will solve the conflicts in the region. We don’t believe the talking point that this is the core conflict in the region. It’s not,” said Greenblatt. “At the same time, it will lend stability to certain areas and we think that if we succeed and if the region allows us to succeed and helps us to succeed, that a lot of people will benefit from this deal, first and foremost Israelis and Palestinians.